As for 2018, we have now been blessed with the good fortune of DOG, and it’s about time. Like many of us, your New Years resolution may include being happier and healthier, but for some it may even include welcoming a furry addition to the family. You can smash all three of these goals with one adorable ball of fluff, plus with the added bonus of saving a life. This issue is fun to read and I am certain we found some topics to reach you where you are in life right now. You just started on your raw food journey then you start craving pizza? Find out how you can manage your pizza craving here, and even throw a party or two with friends! We also included helpful extras for spring cleaning, healthy living and staying beautiful inside and out. There is plenty more inside, just remember to read in on the exclusive interview with Kimberly Gauthier about how she raised her furbabies with raw food and find more about our featured Raw Food chef Anya Andreeva. Both are fascinating ladies! Should You Try Salt Cave Therapy? Raw Vegan Breakfast Pancakes – no more boring breakfast, we promise! 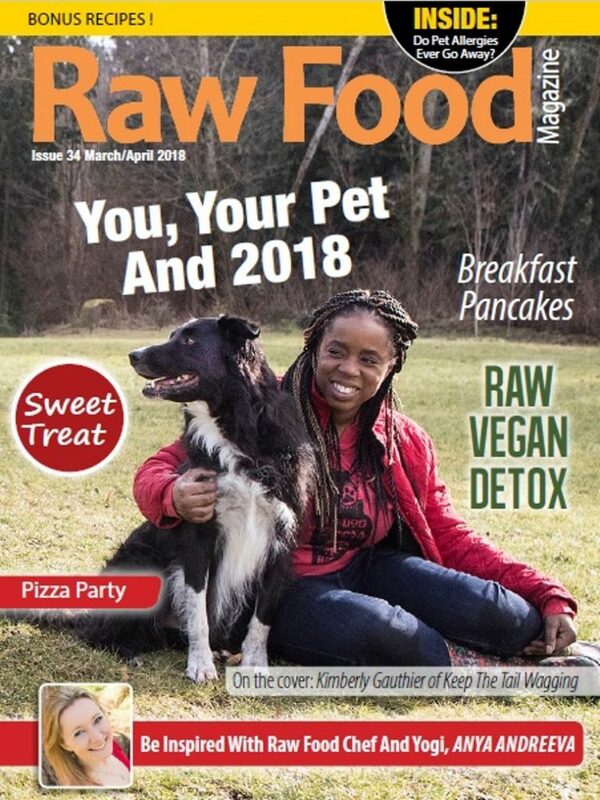 Raw Vegan Sweet Treats – wouldn’t it be great to have delicious dessert options that won’t leave you feeling like you’ve fallen off the healthy eating wagon? Look no further. Bonus!!! A pizza party you, your friends and family including your furry pals can enjoy!! !